I love a good crisp deli pickle. You know the kind. They have a green skin and a pale white interior. The have a snap when you bite into them and the garlicy brine is just right. These are just like that! 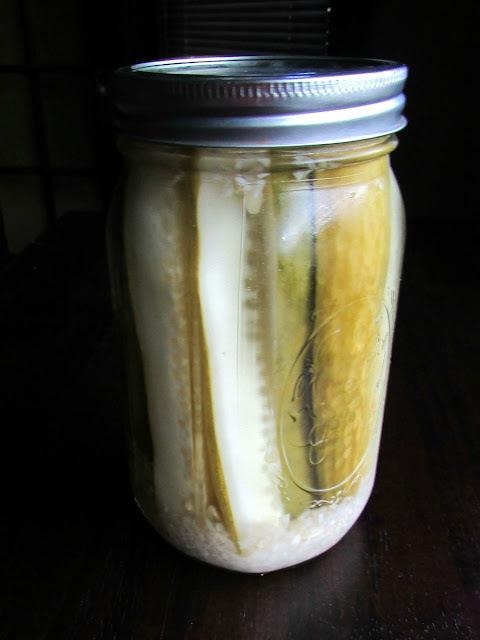 My cousin Cori shared the recipe that she uses for refrigerator pickles and it is amazing! It is a great way to use up the glut of cucumbers coming out of the garden right now. The best part is, you don't have to can them! Just stick them in jars, cover them with the brine and let them sit for 3 days. Waiting is the hardest part! After that, you can keep them in the refrigerator for months. I doubt they will last that long, but go ahead and try! In a saucepan, boil the onion, garlic, mustard seeds, water, vinegar and salt until the salt is dissolved completely. Let cool. Meanwhile, slice the cucumbers lengthwise into spears. Place dill in jars. Just divide it up between the jars you plan to use. Then fill jars with cucumber spears. Pour the liquid over the cucumbers. Place lids on the jars and let sit on the counter for three days, shaking occasionally. After three days on the counter, refrigerate at least over night but up to 6 months. They are ready when you are! I think my husband would really like these. Thanks for sharing the recipe! I hope he loves them! 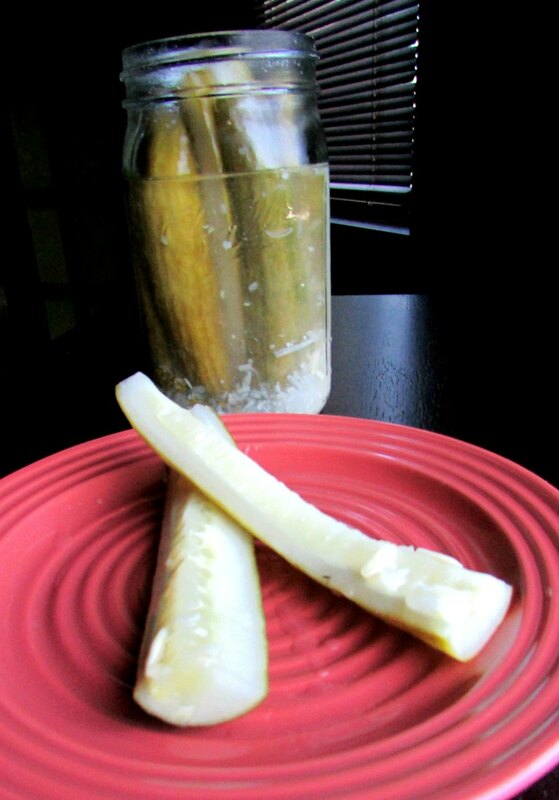 I am a really big fan of the deli style pickles, so they were perfect for me! These sound very simple. I'm going to have to give them a try! They are easy and delicious! Canning is still a bit intimidating to me, so anything I can make and pop in the fridge or freezer is perfect! We filled 6 quart sized jars with this recipe. You can certainly do it! Your recipe is featured at Full Plate Thursday this week. Hope you are having a wonderful day and enjoy your new Red Plate!